What are some types of sports injuries? ‘Sports injuries’ are injuries that happen when playing sports or during exercise. Most commonly they are accidental; however other injuries can result from poor training/playing quality or improper gear. Poor conditioning can also play a role in increase chance of injury. Listed are some of the more common sporting injuries. What is ‘Acute’ versus a ‘Chronic’ injury? Know the difference between being sore and being injured. Never try to ‘run off’ or ‘work through’ and injury – it will not get better. Most acute injuries are treated with R.I.C.E (Rest Ice Compression Elevation) in the first 2-3 days. Also a dose of non steroidal anti-inflammatory (NSAIDs) will help pain management and swelling, if advised by your GP. It is then recommended to see a professional who can assess and treat any underlying issues. If an injury is severe, call an ambulance or go to hospital. Rehabilitation is an important part of treatment, step by step getting you back onto the field, court, pool or course. How Can I Prevent a Sport Injury? With regular maintenance, the likelihood of chronic injury lessens, as your therapist will “nip them in the bud” and ensure you’re able to participate in whatever your chosen sport is. 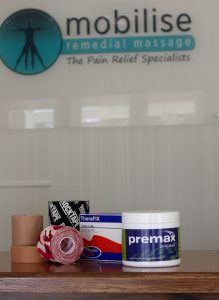 Book a Mobilise Myotherapist or a Remedial Massage Therapist today, and address any acute or chronic sports injuries you may have!